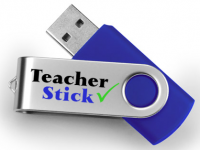 A TeacherStick is a USB drive and like all USB drives can become corrupted. This often happens if it is removed from a computer whilst it is still being used. Do NOT format your TeacherStick as this will remove all data from it. If your TeacherStick has become corrupted here is something to try. Insert the TeacherStick into the USB port of your system. Go to My Computer> and find the TeacherStick. Right click the TeacherStick drive letter and open its Properties. Click Error Checking then Scan/Repair drive. Some versions of Windows have a “Rebuild” button. Right-click the icon of the TeacherStick and “Eject”. Then remove the TeacherStick from USB port. If the above method does not work for you, try following the advice in the video below. Work through the suggestions in the order given. DO NOT FORMAT THE TEACHERSTICK AS THIS WILL REMOVE ALL DATA FROM IT PERMANENTLY. The final idea shown in the video involves using free Easeus Data Recovery software which you can download from here. This software has to be installed on your computer, not on the TeacherStick. When you run the Easeus Data Recovery software it will guide you through recovering the data on your TeacherStick.